By Linda M. Battisti, John Stevens Berry, Sr.
Linda M. Battisti, John Stevens Berry, Sr. In 1958, nineteen-year-old Charles Starkweather gained notoriety as one of the nation’s first spree killers. He murdered eleven people in Nebraska and Wyoming. After a week on the run, he was arrested, later convicted, and sentenced to die in the electric chair. Starkweather’s girlfriend, Caril Fugate, fourteen, was with him throughout the murder spree. Was she his hostage or a willing participant in the murders that included her parents and three-year-old sister? This question still stirs debate more than fifty years later. Fugate claims she was too terrified to attempt escape—Starkweather had told her he would make a phone call and have her family killed if she disobeyed him. Unbeknownst to her, he had already murdered her family. A jury found her guilty of being an accessory to first degree murder. She was sentenced to life in prison; however, in 1976 she was paroled. 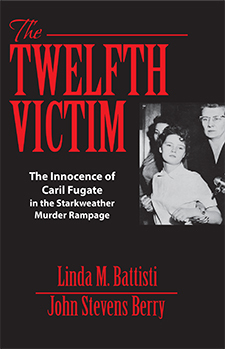 Now, in The Twelfth Victim, attorneys Linda M. Battisti and John S. Berry, Sr. pull together years of research to tell how Fugate was a victim of both Charles Starkweather and the Nebraska justice system. Their book tells how the teenager was grilled by prosecuting attorneys for hours before ever being told she had a right to an attorney. The book details how Starkweather, who gave nine versions of how the murders occurred and had already been sentenced to death, became the chief witness against Caril at her trial. The authors also expose how Starkweather was coached for days by prosecutors on how to testify at Fugate’s trial—including not telling the jury that he had planned to kill Caril on three separate occasions. It is a shocking story that has never been told. Ames Reading Series in Lincoln, Nebraska, featuring the authors of The Twelfth Victim.